By Jochen Heussner, who is the founder of www.PlanetCompliance.com, a leading platform for analysis and insights on financial regulation and innovation. He is a qualified lawyer and seasoned finance professional having worked for many years with international law firms and financial institutions such as Citigroup, Fidelity International and RBC in various jurisdictions. He is also an advisor and board member with a number of companies. You can follow him on Twitter at @JochenHeussner and @planetcomplianc. Regulatory Technology may have been around for a while, but RegTech powered by innovative technologies like artificial is still at a relatively early stage of its development. However, finally RegTech has received the attention it deserves as it can be the key to drive to costs and provide better compliance. So it is not surprising that the firms that enter this space is increasing quickly and it’s easy to loose track of what is out there. That’s why PlanetCompliance developed the RegTech Directory, the most comprehensive guide to the industry, which covers more than 300 companies. Obviously, when you undergo such a massive research exercise, you find out a thing or two, which we wanted to share with you. Why RegTech and why now though? Regulatory Technology, in the sense of information technology that is employed to help complying with financial services regulation, has been around for a while, so sometimes it gets criticised for simply being a buzzword for another hype. Not until recently though – and probably thanks to the increased use of the term RegTech, too – has it been recognised by the financial industry as the great opportunity it is. Recent technological developments in the field of data analytics and machine learning have made a new form of regulatory technology possible and today’s solutions are much more powerful than its predecessors. Cost and the increasing burden of regulation are also important factors that benefit RegTech solutions. In a report from Accenture earlier this year, nine out of 10 financial services industry executives globally expect continued cost increases in their compliance departments over the next two year. Indeed, with game changing regulation like MiFID II around the corner, things are unlikely to get cheaper, but the cost of compliance already takes up a large part of the overall cost of doing business for financial institutions and there is a limit to everything. RegTech covers all aspects of dealing with financial regulation and beyond. It helps with reporting and monitoring, data protection, client identification and onboarding as well as the analysis of new laws and regulation and much more. For instance, when we last went through this exercise we found that a lot of the RegTechs we came across, were based in London, UK. Since then we came to learn that the country where the most RegTechs are based are the United States as you would expect. The last time we counted 115 firms were based there. However, we still believe that – at least to an extent – London is the centre of the RegTech world since most of the 72 firms in the UK that we included in the Directory are based there with only a few exceptions. At the same time, New York as the area with the most RegTechs only has little more than 30 firms located there despite the importance of its financial centre. Other locations like the wider San Francisco area including Silicon Valley or Chicago almost seem to be equally attractive. London’s success as a RegTech hub is based on the combination of the leading financial centres of the world with the support of innovation firms receive there. It will be interesting to see if and how this changes in the wake of Brexit, but for now it doesn’t seem to have much of an impact yet. With regard to the rest of Europe, Switzerland is the new number 2 with Ireland hot on its heals, but neither of them come close to London, which doesn’t mean that you won’t find exciting firms and solutions there. Germany and France have been very active in trying to pry away financial institutions from the UK following the Brexit decision, but in respect of there representation of RegTech firms the results are rather disappointing, and there are both battling with Luxembourg, thanks to its thriving funds sector and respective support sector, and countries like Sweden or The Netherland, which are very supportive in terms of innovation and startups. Most of these offerings focus are rather local or regional though as they seem to focus on their home countries, while many have additional offices elsewhere. Outside of Europe, Australia outshines Hong Kong and Singapore and many of the RegTechs from Oz have a strong presence in the Asian markets. There is very little in Africa with the exception of a few firms in South Africa and we are not aware of any RegTechs in South America, but we would love to hear about it, so please get in touch if you know of someone. In any case, it highlights the importance of a well-established financial centre as a foundation of a successful RegTech solution despite the fact that the Digital Age has apparently made location less relevant. Interestingly, when looking at the distribution of firms focusing on Data Protection (i.e. solutions that focus on protecting the privacy of individuals in data use especially in light of new regulations like the GDPR, which require financial institutions to adapt to a different framework.) as the primary activity, all but one category is equally allocated: Data Protection, however, appears to be to a great degree the dominion of US firms with only 4 Swiss firms and the odd firm in other locations. In light of GDPR and other regulations that have a very strong impact on privacy, this comes a bit of a surprise; though several firms in Europe also offer Data Protection services in addition to other activities. Are you going to #RegTechRising? Talking about activities, what is the most prominent of the eight categories we classified RegTechs in? If you have said Client and Counterparty Identification, you are right with almost a fourth of all RegTechs naming it their primary activity. Helping financial institutions with the gathering and processing of the necessary information for KYC and AML purpose or other forms of Due Diligence seems to be the area RegTechs have identified to apply innovative technologies. Considering the time and costs these checks consume in traditional processes, this is not surprising though. General Compliance, accounts for 28% and thus more than CCI, but this is due to the fact that General Compliance refers to all solutions that don’t fit in one of the other, more traditional RegTech categories or deal with new trends and aspects that don’t fit into those. As such, some firms may be focus, for example, on regulatory risk modelling, scenario analysis and forecasting could be such activities or all actions to evaluate and oversee a firm’s internal culture and behaviour, while others relate to workflow management. Therefore, it isn’t really one category and can’t be considered the top one. Monitoring with almost 14% follows with Reporting accounting for 9.3% and Data Protection, Data Warehousing & Analytics, and Legal & Regulatory Analysis each come up with 7.6%. Especially, the latter though seems to be an area that is the most intriguing as Artificial Intelligence as well as machine readable regulation might have the biggest impact on the Compliance profession and we’re very curious to see how it all pans out. 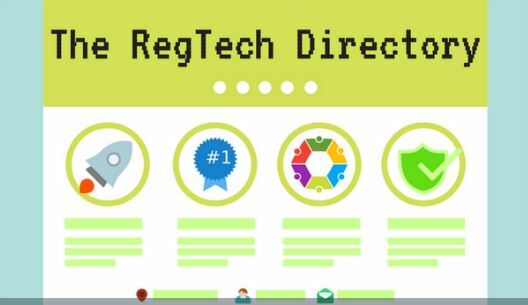 Training as it was in our first RegTech Directory still only accounts for a handful of RegTech solutions, 2.3% to be precise, though we would hope to see more of them since Compliance training, for instance, is an area that notoriously could do with some help. Obviously, you have to bear in mind that many firms are active in more than one category (one claims to over all aspects, for instance), but if you had to stick them into a category of their primary activity (which we did) these are the numbers. A recent report by CBInsights stated that RegTech start-ups had raised approximately $3billion since 2012 though that included Regtech firms from other sectors than financial services as well. Our research finds that the over 300 RegTech firms we have listed in our Directory have raised close to $1.9billion with the actual number though likely to be significantly higher since many firms do not disclose the amount they have raised or the funding rounds at all as they are predominantly privately held companies. These are exciting times for RegTech and with a myriad of new regulations like MiFID II or GDPR around the corner, the demand for clever RegTech solutions that drive down costs and help to ease the pain is not going to go away any time soon. If you want to know more about RegTech and the different Irish firms that are operate in this sector, visit us at www.planetcompliance.com.